Our goal is to assist you in every way, from searching and buying your first Flemish, to offering suggestions and advice on housing, health care, general care, breeding, raising, and showing. 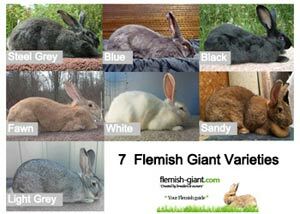 For your convenience, we have added a list of Flemish Giant Breeders here. All breeders listed below are currently raising Flemish. As always, we wish you the best of luck in your search. 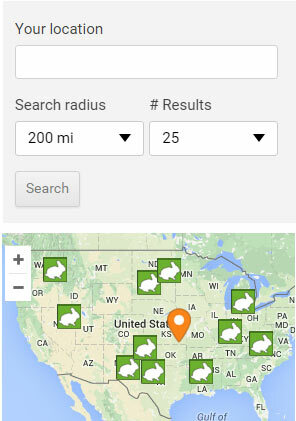 IMPORTANT UPDATE: We refer to our other website RabbitPedia.com, for a new UP TO DATE Rabbit Breeders Directory with a map. We invite Flemish Giant breeders to list their Rabbitry! You can still use the map below but since Google has updated it’s policy it no longer functions the way it did! Therefore we refer to rabbitpedia!